[ENG] Fighting First Peoloponesian War! 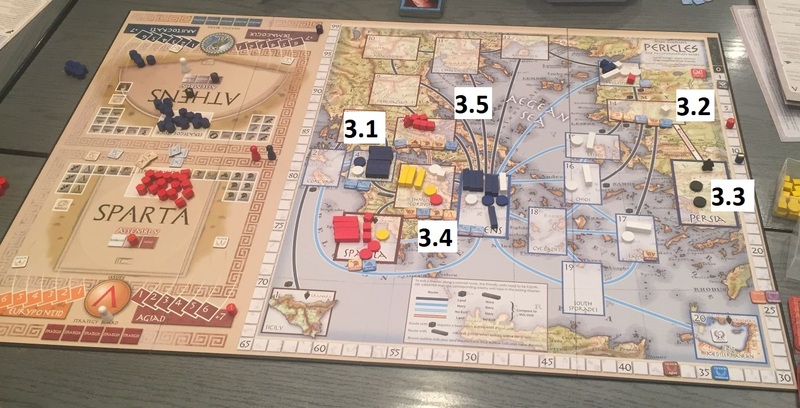 After very successful session with Pericles Vignettes – introducing Lukasz and Leszek to the game – the time came for a full, large-scale Pericles scenario. 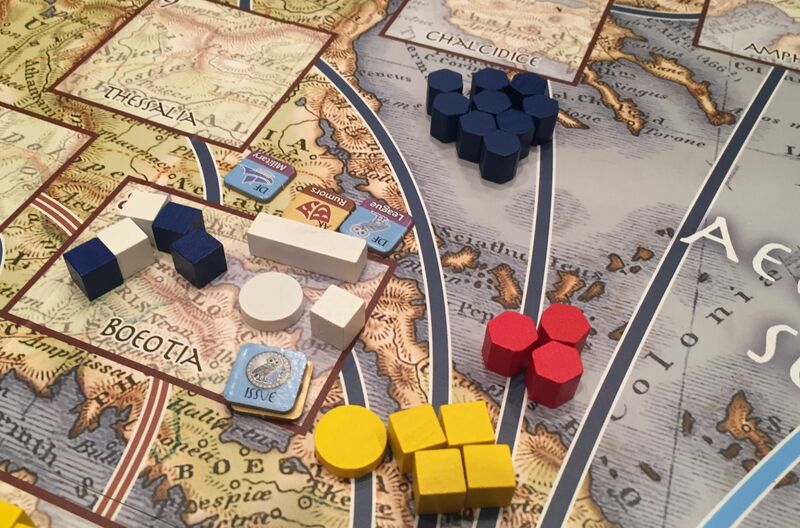 We decided to start with the First Peloponnese War – it will take us from 3 to 5 turns which should be just exactly what we need for a full evening. 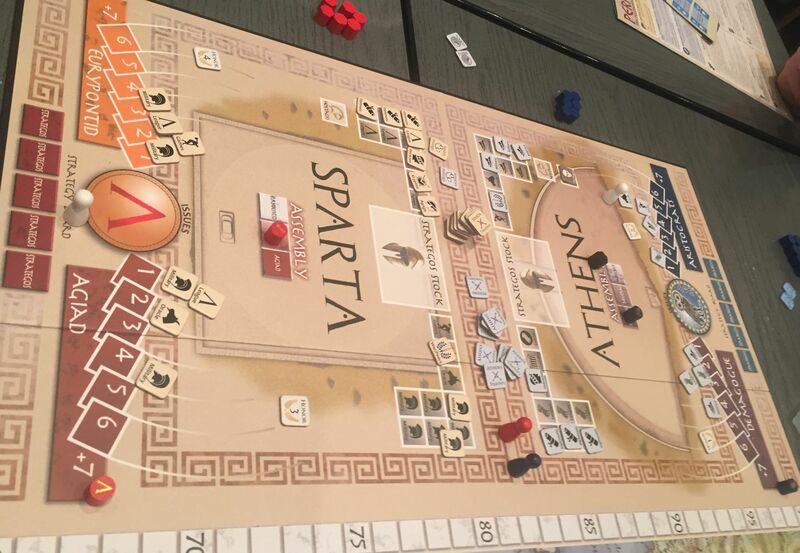 The question was how to play with Athens to avoid bitter defeats which this City State suffered in our Vignette Scenarios. Maybe via special victory conditions (geographical and economical bonuses)? We shall see. Let us do not forget that for 3 out of 4 players this will be only second time with that game! During the political phase the governments changes thanks to Ostracism – in Athens from Kuba to Lukasz, and in Sparta from me to Leszek. And war is also declared! 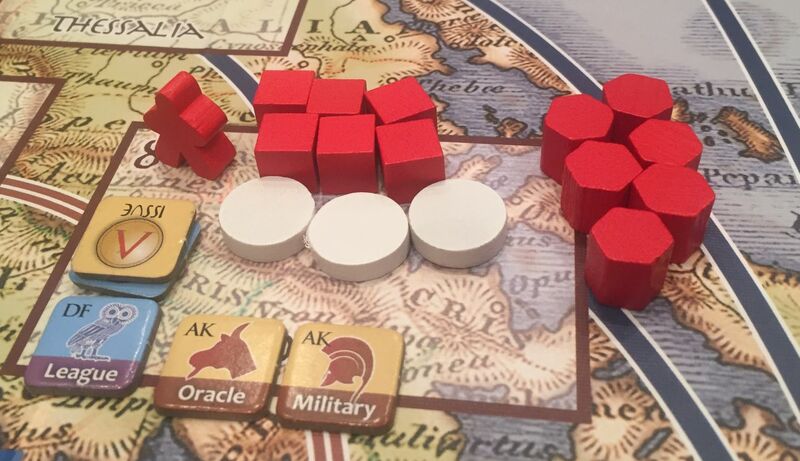 1.1 – my and Leszek strategy is focused on raids – and they are especially successful in Corinth! 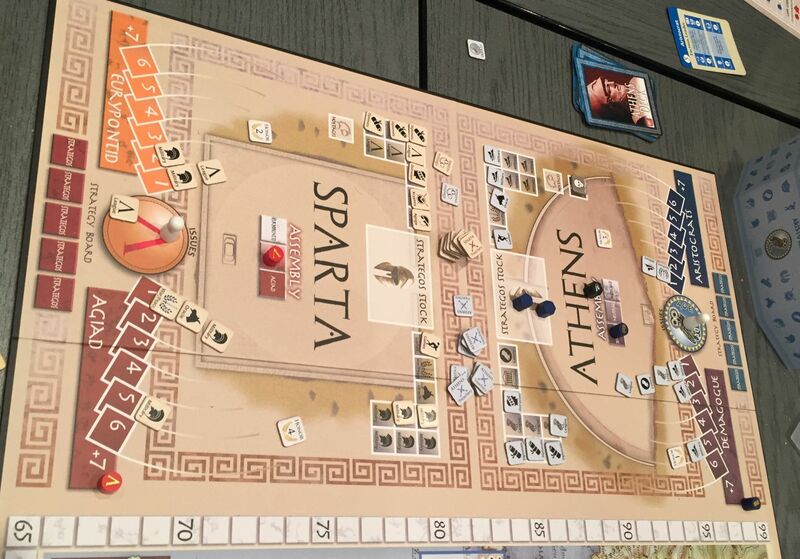 1.2 – Athens of course are focused on Persian war, which they manage to conclude. 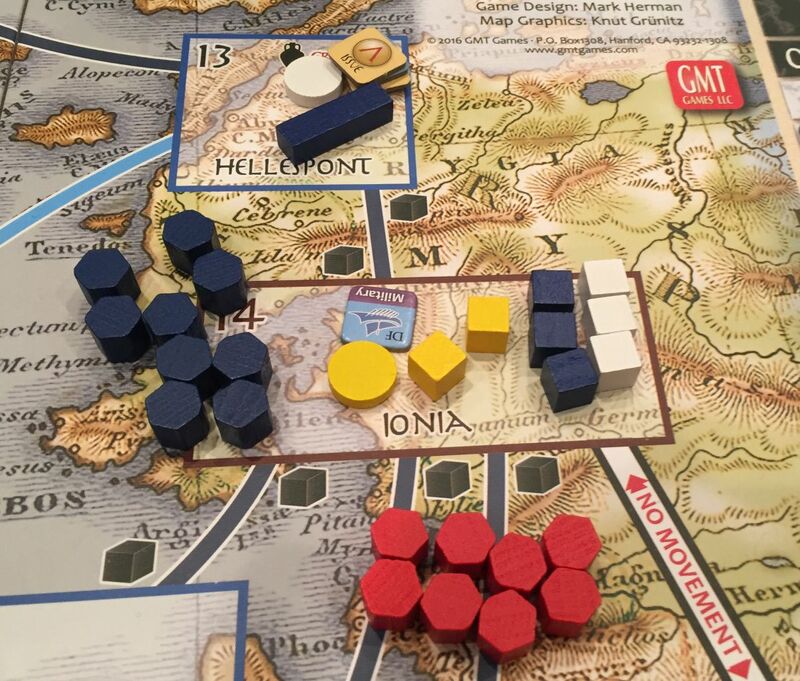 1.3 – in the meantime, lonely Diplomacy in Ionia brings real havoc among Athenians! …which was not fulfilled as the political phase brought signing of the peace! 2.3 – …while Spartans does the same! Some raids, Oracle and couple of clashes but nothing crucial; this turn. Unfortunately the last we managed to play (time constraint) but very exciting. Aristophanes – again, nothing fundamental – 6 startegos less and couple of additional issues. In Political phase a lot of potentially harmful (=Military) issues are being discussed. There will be a lot of action despite fact that peace is NOT signed..
3.3 – However, bases in Persia are being constantly build. We have 2 of them already and manage to pump navy in Sparta! And the pay back time! 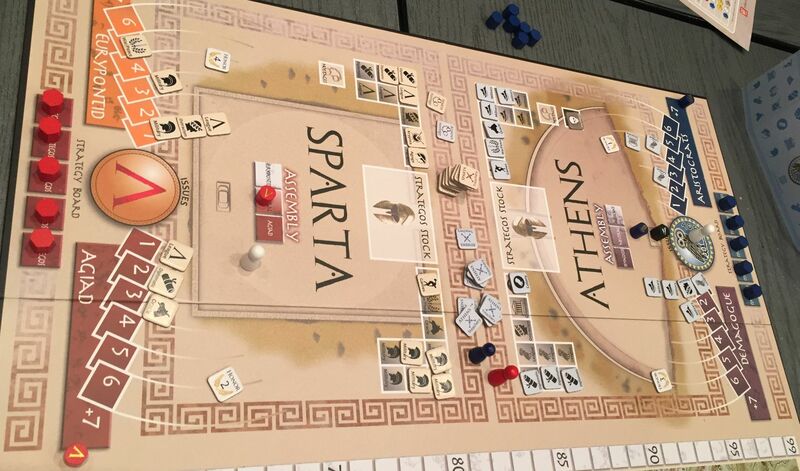 War Score: Sparta 61 – Athens 58 – Sparta takes minimal lead, and if played longer – everything can happen. We did not coutn here the special, end of game bonuses. That game is addictive. All of us – just when we finished – was discussing what we shall do differently next time, how to play, what to enhance. It was really encouraging and I am sure will result in future games! Next Next post: [ENG] Introducing Cataclysm!